First of Spliced Surprise Major in hand: 7-8. For Jane G Greely, 1925 - 2019. Last updated Saturday, 16 February 2019 at 08:50:45. First submitted Sunday, 10 February 2019 at 23:41:13 by Michael J Trimm. 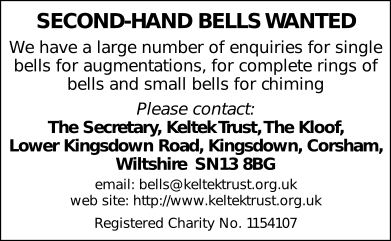 Sent for publication in The Ringing World on Monday, 11 March 2019 at 10:43:21, and printed in issue 5631, page 310.